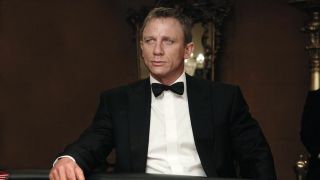 Will Daniel Craig be back as James Bond? This question should get answered by someone with official clout, but until that time, we'll settle for this newest rumor. Word from the Daily Mail, and its unnamed sources, is that Craig was offered a pretty sweet deal from MGM who wanted to keep him on as the spy franchise's headliner. For a further two movies he was offered £68 million - that's about $100 million - but turned down the offer. A "money deal"? What else might he be offered? Some killer Groupons? If the rumor does prove to have a shred of truth to it, it doesn't seem at all surprising. Craig's made it clear in the past that he's not interested in returning. Last year he dropped the sound bite to end all sound bites when he said he'd rather slash his wrists than play 007 again. He added that he doesn't care who takes over from him, but wished them luck. That seemed to be Idris Elba for a time, until Tom Hiddleston took over as the bookies' favorite. The next Bond film is currently without a release date, so we might have a wait on our hands 'til we find out who'll be picking up the Walther PPK.